John Ward’s playing days at Watford were relatively brief. He spent a couple of seasons at Vicarage Road as a back-up striker, although he weighed in with a few important goals. But his contribution to Watford’s success in the 1980s was significant because he returned as a coach when the team reached the First Division and was later Graham Taylor’s assistant manager. Ward knew Taylor from his Lincoln days. They became, and remained, firm friends as well as colleagues and this interview, conducted over a very enjoyable couple of hours at The Belfry hotel, felt like a big breakthrough. Ward spoke at length and so engagingly about his time at Watford, offering a level of insight that felt like he was taking me to the heart of the dressing room. This was one of the longest interviews I did for Enjoy the Game and I’ve chosen to reproduce it in full here. You already knew Graham Taylor from your days at Lincoln City. Can you remember first meeting him? When I signed forms for Lincoln City in 1970-71, they took me into the dressing room and said, ‘There’s your stuff.’ It was on the peg next to Graham Taylor’s. He was the club captain and he took me under his wing and we got on very well straight away. We still get on very well today. I think Graham started coaching at the age of 19. If you can map out your life in football, Graham was already on the way to doing that at a very young age. He became manager of Lincoln at the age of 28 and he realised I was interested in coaching too so four of us set up the Lincoln and District Coaches Association. I was the youngest, so he made me secretary. That was an early sign of Graham’s skill at delegating. Was Graham different towards you when he was a manager compared to how he had been as a player? Under Graham, my playing career got better, for sure. Under the previous manager I was in and out of the team, but with Graham I became a regular and we had our success in 1975-76 winning the Fourth Division with a record points total. Graham will claim he doesn’t but he remembers every result, every success. And although he went on to Watford, Aston Villa and England he was very proud of that success at Lincoln. Even though he was young, Graham was an authoritative figure. As a player, he played both left and right back and he’ll tell you it was because he’s two footed! When the management position came up at the age of 28, he jumped at the chance. He was destined to do it. But it wasn’t an easy start for him. He went into double figures of games without a win, and there were the beginnings of discontent [among the crowd]. There were people within the club who thought it was a mistake putting a young person in charge. But Heneage Dove, who was the chairman – and a lovely guy, a straight-laced gentleman – wanted to stick by his man. He believed in Graham and he gave him time and, of course, that worked out very well. What was Graham like as a young manager? Very focused. He was very organised, very thorough. We spent hours on the training ground and he was very quickly very good at getting the best out of lower division players. We spent hours on the training ground getting organised and working on the sort of situations we faced in matches. He coached us. He trained us, by the very definition of the work, in that he taught us what to do, where to be, how to think about the game. He put together a real ethos at Lincoln, just as he did at Watford. Was there a family club atmosphere at Lincoln too? Very much so. He very much made sure the club involved the players’ wives and girlfriends. At one of the club functions he announced to everyone that he wanted the club to feel like a family. He’s a big family man himself and he wanted that to be throughout the football club. Going from a player to a manager at the age of 28, did he find it hard to tell you what to do? At first he did it gently. He didn’t come in and lay the law down. He had authority because he had been the captain but of course it’s different being the manager when you have to pick the team and leave people out. He let things evolve and he earned their respect gradually. But it’s only in the last few years I’ve stopped calling him gaffer or boss. He took charge and he took responsibility and because of that the sense of authority came. The thing about Graham is that he’s a very likeable person. Even when he’s telling you off, you don’t think he’s a nasty man. What was the impact on Lincoln when he left to join Lincoln? We lost something, that’s for sure. He took Sam Ellis and Dennis Booth with him as players too so we lost their influence as well. He didn’t come back for me at that time, I stayed at Lincoln for another couple of years. Lincoln appointed Willie Bell as successor and he wanted everything concerned with Graham Taylor to be removed from the club and that annoyed a lot of people, including me. I rebelled against that because it just wasn’t right. Our groundsman was even told to burn the paper and pencils from the office because they’d been Graham’s paper and pencils. The groundsman didn’t do it, he took them home. I can see what the new manager was trying to do, but he should have embraced things instead of alienating a group of people who had done very well with Graham Taylor. We got relegated and it all felt very traumatic. There was no smooth takeover at all, the club was trying to do everything so differently, and so when Graham came in for me and asked me to go to Watford I jumped at the chance. Had you kept in touch with him? Yes. Graham and I spoke regularly. He didn’t ask too much what was going on – I don’t think he wanted to be like a ghost of Lincoln’s past, if you see what I mean. He didn’t want to influence what I thought either – although I already knew what I thought. We spoke because we were friends and because I was interested to know how things were for him at Watford. Was that a surprise? After all, Watford were in the Second Division. Lincoln were in the Fourth, Chester were in the Third, so it was leapfrogging up two divisions. That’s a fair point. I had done eight years at Lincoln and I wanted a two-year contract so I’d get a testimonial year but they only offered me one. Going to Watford livened up my life as well as my career because you see different things, you see more of the world. I was the new boy, so I couldn’t say anything. My face had to fit with these lads, so I am sat waiting because I know what’s going to happen and I’m not sure the other lads knew. The meeting was in the home team dressing room at Vicarage Road. Graham was late coming down. Whether he did that on purpose or not I don’t know but the players were getting a bit restless. Steve Harrison got hold of a football and said, ‘I’ll show you how much I’ve improved over the summer,’ and started to do keepy-uppy with it. But he smashed one of the long fluorescent light bulbs on the ceiling. Some of the lads were laughing. Steve cleaned it all up. To be fair, his control was pretty good for him but he smashed it and broke this lightbulb. That took the sting out of things and the tension there was in the dressing room eased. Obviously Steve didn’t do that on purpose but there wasn’t the confrontation there could have been. Graham said calmly, ‘Look, this is how we’re going to do it.’ I saw that he had the same authority in the Watford dressing room that he’d had at Lincoln. Did you think you could push Luther Blissett or Ross Jenkins out of the side? Then he signed Malcolm Poskett so there was a lot of competition for places up front. I wasn’t going to be as successful as Luther and Ross. I wasn’t going to get them out of the team. I knew from the start I was coming in as a back-up player. For me, Lincoln had just gone down to Division Four and I was being given a chance, at the age of 28, to go to Division Two. I wanted to go and be part of it, and try to get a few games. I’d had a few cartilage operations so I probably couldn’t have played at every game at that level anyway. I was a good player for a manager because I was easy to leave out. He could drop me and I wouldn’t complain. I’d give my best for the reserves and I’d give everything in the first team when I had the chance so I suppose I was reliable in that sense. I think I played 20 games in the two years I was there and that was good for me. I would be a good sub, or carry the skip. I’d do all that and I think for some of the younger ones they’d see that and think that was what was expected of them if they were sub. But the thing for me was that I was going to Cardiff and Birmingham instead of Rochdale, so I was seeing a different side to the game. I scored my first goal for Watford against Colin Todd at Birmingham and we won 1-0 and for me that was fantastic. Colin Todd had played for England and Birmingham were a big club and I scored the winner. I was never going to get Luther and Ross out but I was happy to be part of it all. My joke was always that people thought my first name was ‘To travel’. Because the team list would go up on the board, one to eleven with the sub, plus ‘To travel, Ward’. The hardest thing was getting the skip up and down the steps from the main stand to Occupation Road. You said you were happy with that role but did it not frustrate you? Not really. I was fine with it. I trained in the week, I had my games, sometimes I was on the bench. Sometimes I travelled as a non-playing reserve. But the way I looked at it, there were some good players who weren’t getting to travel. And from a personal point of view, I had a young family – my youngest daughter was four years old, so my kids were growing up in a very pleasant environment. That season [1979-80] was a bit of a scrap. The threat of relegation was just over your shoulders. Did you see a different side of Graham at all? Graham’s managerial career had been success all the way to that point. Watford had developed from a greyhound track with a football pitch in the middle to a proper club. But I think that year was a struggle. Malcolm Poskett’s goals kept us up, but that was the lowest number of goals a team of Graham’s had ever scored and that hurt him. That really hurt him and his pride because he wanted to create entertaining football for people. He sat down and thought, ‘Right, how am I going to change this.’ He thought the football wasn’t as exciting and forward thinking as he’d like it, but initially he thought he couldn’t be like that in the Second Division. Perhaps he thought he had to change it and play more the way people expected him but actually he realised that he could do what he wanted. He just had to go for it. The one thing that did hurt him was the lack of goals the team scored that first season. I like to see people pass properly but not passing for passing’s sake. I like to see teams get wide and shoot and dribble. What is effective football? We got labelled ‘long ball.’ It’s unfortunate. ‘Direct’ is a little bit better but it still conjures up images in people’s minds of uncontrolled football. But how could it be? How could a team finish runners-up in the First Division, play in Europe, reach a cup final and produce those players just by kicking it up the pitch? He changed the system of play a little bit that second year. He’d thought he had to do something different, perhaps be a bit more sophisticated or what have you, but actually it took him that first year to realise he didn’t have to change and become something different. Being different might have detracted from what we were good at. Did it annoy you that you were labelled long ball? It gets to you a bit. People try to label it as average but it’s not. It’s very good, effective football. The people of Watford loved it because it was successful and exciting. We produced international players – Jackett, Barnes, Luther, Callaghan – and an international manager. You left as a player and about a year later you came back as a coach. Coaching had never crossed my mind really and I knew there was a limit to what I could do for him as a player, so I went. But then he invited me back as a coach and I jumped at the chance. I would have come back to hand out bibs and put out the cones. The fact that I became a part of his coaching team was such an honour, it really was. As a player you see GT as the top man and everyone else does as they’re told. I’ve been at two clubs with him and that is how the players see him, no question. Now I was being treated as more of an equal. When he brought me back as a coach, he invited me to his house and we went and sat in his loft where he had a little office and we talked for four or five hours one night. He showed me all his match analysis work. How goals are scored, how matches are won, loads and loads of very detailed work that he’d obviously used as manager of Lincoln and Watford, but that as a player you didn’t see. You just saw the coaching session and did what was asked. Now he was choosing to share all this with me, and it was absolutely fantastic. I sat there that night going through all this stuff. As a player I knew what we’d done on the pitch, but I didn’t know fully the reasons why we’d done it. Graham knew exactly why we’d done it and now he was sharing this with me. He’d had people analysing matches, he’d analysed matches himself and he had a very clear breakdown of how you won a game. It was presented in a very basic way for the players but the theory behind it was a lot more complex and when I started working with Graham as a coach he began to share all that with me. The team gets 25 crosses in per game, okay so that may be the statistic but there’s a lot more work behind that. It’s not just about getting the ball crossed into the box. It’s about everything – how do you get the wingers into the right position? How do you get the ball to them? What do they need to do to actually deliver the ball? Where are they aiming to deliver the ball? Where do Luther and Ross run to? Does someone come in at the far post as well? Where do Kenny [Jackett] and Les [Taylor] go to back everything up and pick up the knock downs without compromising the defensive aspect? Where does Wilf [Rostron] go? What should the defenders do? Who’s watching for the opposition breaking out if we lose the ball? Talk about detail. That’s your detail. Every single aspect of the play was looked at. He’d set Barnes and Callaghan the target of 30 crosses and say, ‘Right we need another two or three each off you.’ But then Graham would have to work back and make sure the team could enable them to get their crosses in, so we had to work with Wilf or Pat [Rice] or Kenny or Les so they could bring John and Nigel into the game. Each player knew their own job. Graham knew everyone’s job. He’d work it on the training ground. It was simplified on the training ground, so that each player could understand exactly what it was they were being asked to do. But in his loft, that was where his work was done. The analytical work that was being done is now taken for granted with computer analysis of matches but back then must have been quite groundbreaking. I’m sure he wasn’t the first or only one but he possibly went deeper into it than many people. At that time, he had people in the stands marking the stats on a pad, short-handing everything. I took one of these guys to an England under-21 game at Stoke because he didn’t drive and I watched him make his notes. Within a couple of days he had a detailed report on Graham’s desk showing exactly what happened in the game. You’re right, it’s all done on computer now. What was it like being part of the coaching staff that season? The first team were getting promoted and you were in charge of the reserves, weren’t you? It was fantastic that he was showing me all this and trusting me with it. And it was great to be part of his team. There was a social side to it all that brought us all together. He’s fantastic company in a social sense. With work, he really worked but we had some down time as well. When I was his coach, I learned he was not the dictator that the players thought he was. He was able to delegate his work to myself, Steve [Harrison] and Tom [Walley]. He didn’t do everything himself, he had hired us to do our jobs and he trusted us. Tom ran the youth side and he reported back. I ran the reserves and reported back. Occasionally Graham would come into the dressing room and had a word but generally I ran the reserve team and was free to make my own decisions. He supported his staff and let them have responsibility knowing that we were working to produce players who would be good enough for his first team. I took the schoolboys training at the YMCA from six till nine on a Monday night with myself and Dennis Gibbs [Nigel Gibbs’ dad]. That was a great education for me to work with the kids. I thought ‘Why am I doing this when I’m the reserve team manager?’ But now I know why, because it was great for my development as a coach to work with those lads who were so raw. It was my job to develop the reserves for the first team. Richard Jobson, Jimmy Gilligan, Ian Richardson. At that time the reserves would play on a Saturday. So if the first team were away we’d be at home and we gave free tickets for the reserves to all the local school kids and we’d bring a thousand or two through the gate. Great move. How exactly did it come about that you returned to Watford as a coach? When I was a player, I don’t think Graham was thinking of me as a coach. Even though Graham is a great planner, I don’t think he had that in mind at that stage. I thought I would maybe get one more year at Watford as a player but that didn’t happen. I was decorating our house and I had four tiles to put on the window sill to complete the kitchen and I got the call to say they weren’t renewing my contract. They were giving me a free. In disgust I refused to put the four tiles on the window sill! I was really disappointed to go but my friendship with Graham survived because it was a very professional parting, even if I was very disappointed. I joined Grimsby as a player and halfway through the year George Kerr got the sack as manager and I was asked to do some coaching. I heard Sam Ellis was leaving Watford to go into management himself and word came through that I should apply for the coach’s job. I had a call from someone saying that Sam was going. Then I saw an ad for the Watford coaching job in the paper, the Daily Mail, I think it was. I rang Bertie Mee to see if I could get a steer on it and he said, ‘Well John, if you want to apply for it, apply for it.’ He was giving nothing away. That was Bertie. I thought he’d give me an inkling as to whether it was worth it, or perhaps even put in a word for me, but no chance. Anyway, I applied and myself and Steve Harrison were given an opportunity. I went back as a coach and reserve team manager. Graham was taking the England under-19s at that time so he gave me and Steve a lot of responsibility straight away. That was when I felt so pleased because this manager I respected so much was offering me this responsibility. What was Bertie Mee like? He was one of England’s legendary managers having led Arsenal to the double. I loved Bertie to pieces. He was the archetypal gentleman. I don’t think I ever heard him swear. But he used to put people down with such an elegant choice of language and without needing to swear. He could put you in your place. He’d answer the phone and say, ‘Mee here.’ Steve picked up on that and used say, ‘Mee here,’ ‘Who’s there?’ ‘It’s Mee,’ ‘Who’s me?’ Bertie was only a short man so he had the tallest chair in the staff room. I remember we’d sit round trying to work out what we should ask Bertie about next because we just loved listening to him talk about football. But he didn’t talk about things unless you asked him, so we used to ask him about any aspect of football, coaching, management, just to hear him speak. Once you got him going we could listen to him all day. We’d ask him about Charlie George or Frank McLintock and Steve and I would sit there and listen to him like little boys. It was fantastic listening to him and we learned so much. Bertie was the organiser. Graham was very much involved in everything. It was a bigger football club than Lincoln and it was growing bigger, especially by the time we were in the First Division. It had gone up the divisions and he needed someone who’d been there who could give him the benefit of his experience and that was Bertie. As a young coach I wanted to change the whole world. Myself and Harry would say, ‘Let’s change the world,’ and Bertie would say, ‘Well, you won’t change people’s characters. You might alter them a little bit but you won’t change people.’ I’d say, ‘I will, Bertie, I will.’ ‘Well, we’ll see, shall we,’ he’d reply. He was always right. Graham was very hands on as a coach, in his tracksuit, on the pitch. Bertie was behind the scenes. He taught me the scouting system. How it was organised, how you’d talk to people, how you’d strike up relationships with people so you could get the best out of your scouts. Bertie was doing the scouting when I first came back. Some people were good at doing team reports on the opposition, some were good at looking at players, some were good at non-league. You had to have the right people in the right jobs. And you had to have relationships with people, so I’d spend Thursday nights, sitting on the bottom of my stairs on the phone. You can’t just say to a scout, ‘I want you to go and watch Brentford on Saturday.’ You had to ask about him, his family, where he’d been, what he’d seen that week. It was a full conversation. They’d get petrol expenses and that was it. They were doing it because they loved the club or the people they worked with so you had to have a relationship with them and keep those relationships otherwise they’d give their recommendations to another club. You had to make them feel part of it. I have a scout at Carlisle United who has been associated with myself and Graham for 30 years. All he ever got paid was his petrol money. We had a little dinner for him recently. He was good at it but he didn’t do it for the money. What was it like being the reserve team manager while the first team was finishing runners-up in the First Division? Did you feel you were missing out? Some Saturdays I was with the first team, sometimes I’d take training, so I was involved and part of it. I used to pinch Tom’s best players for the reserves and sometimes Graham would pinch my players for the first team but that was what it was all about. We were all trying to help the club be successful and we knew that it was first team results that would decide if we were successful or not. There was no chance to get an ego, no one was allowed to get an ego because there was always a job to do. There was one club car, a Fiat Panda. We called it the twin tub after a washing machine because it looked like a washing machine. Steve Harrison drove the van to training at Stanmore every day, picking up the young players. I shared the twin tub car with Billy Hails [the physio]. I remember going with Roy Clare [the kit man] to see Leicester and Leeds reserves play on the same day. Leicester first, then Leeds, then home. It rattled all the way there and back. We were second best out of 92 clubs that season [1982-83] and it was a big thing yet we kept our identity all the way through. My children are similar age to Steve Harrison’s and Tom Walley’s. We’d be invited in and the kids would come into the boardroom. Some directors from other clubs would look down their noses and say, ‘Wives and kids in the boardroom?’ But that’s what we did. I remember when the match ball was coming into the ground one day by helicopter. I have no idea why they were doing it but we knew someone was going to drop out of a helicopter on a rope and put the ball on the centre spot. Ally, my wife, was there with our kids and the kids wanted to watch the helicopter come in. So Elton John took the kids out to see the helicopter. After matches we’d all stay in the boardroom after the away team had gone and we’d send someone up to get the fish and chips from the chippy. It would be Elton, Graham and us, our wives and kids, all eating fish and chips at the boardroom table. My kids and my wife loved the club. It was a family club in every sense? Yes, what we did we also tried to make happen for people in and around Watford. The Junior Hornets, the Family Terrace – that was a brilliant idea – simple but brilliant. A way for parents to bring their kids to a game and know they’d be able to see the game and they’d be safe. There were events for the community, kids parties, open days and it all contributed to the desire to do well. Eventually you were made assistant manager, I think in 1985? Yes, but Graham trusted you to do things for him before that. I remember one summer we had a pre-season trip to Majorca . It was after the cup final and I think Graham needed a break. If you think about it, he’d been flat out for six years. He’d had promotion to the First Division and all that to prepare for, then the European games. I don’t think he’d had a proper holiday for a while. Anyway, after the cup final, he said to me, ‘I’m going away. I’m having a holiday, you can’t contact me. If you need anything, contact Bertie.’ Graham wanted a fortnight completely away with Rita. I thought, well, nothing can go wrong in two weeks. This was in May, right after the season. Gerry invited me over to have a look. I’m thinking that a weekend in Majorca would be pretty good so I flew out there, I met Gerry and it was fantastic. Everyone knew Gerry. We’d go in a bar and Gerry would get bought beers. We stayed in a lovely hotel and Gerry said, ‘This is where the team will be staying.’ We were told we’d get paid this amount for coming and it was all sounding really good. The training facilities looked good. I thought we couldn’t go wrong. Graham gets back from his holiday and I explain what we’re doing – a week in Majorca in August, two games. He doesn’t say anything. Anyway, the trip comes round and by that time Barcelona have appointed Terry Venables as manager and the game against us will be his first in charge. Now, Graham and Terry got on fine but they were always winding each other up with comments. Terry used to have a go at Watford for long ball, and Graham used to have a go back for QPR’s plastic pitch and their offside trap. So there was a bit of needle there. It’s July or August time, or whenever it was, and it’s absolutely boiling – the hottest time of the year. Rapid Vienna have pulled out so there’s another team playing [a club from Chile]. The hotel I’d been shown was not the hotel we were staying at. Barcelona had that one and we were a bit out of town. As a result, we didn’t have anywhere to train nearby or a swimming pool. The games are kicking off at 10pm because it’s so hot even in the evening and it’s what they do over there. I’d not known that. And we had the two games in three days, or even on consecutive nights, I’m not sure. [Watford played Barcelona one night and Real Mallorca the next]. I thought, ‘Oh no.’ I’d basically got it all wrong. It was all pretty intense and there was no real time to train because it was so hot. As preparation for the season it was not ideal. But Graham has been fantastic, and never said a word to me. I felt terrible about it. The players haven’t really kicked off but they weren’t too happy about it. No one knows I’ve planned the trip and I’ve heard the odd grumble. I hadn’t said anything either. I’m just keeping my head down but I know what’s coming. As we get on the plane to come home, we buckle up and Graham leans across and says to me quietly, ‘Well, I don’t think we’ll be doing that again will we Wardy?’ [Laughs] It was so simple but it was the biggest put down I’ve ever had. He had hated the trip but he’d put up with it because he knew he’d let me get on with it. I’d got it wrong but he hadn’t given me a hard time about it. It was the mark of the man. The Reserve and Junior sides were successful in the 1980s too and often finished high up the Football Combination and South-East Counties League. Was that also because of the ethos Graham had? Absolutely. We all wanted to be successful at whatever we were doing. I am sure everyone will tell you this but the standards Graham set – and Tom, and Bertie, and I like to think myself and Steve helped to instill these standards in people too – was that you did everything to the best of your ability. Graham praised people for their approach and attitude, not just their talent. Talent is something you are blessed with but effort and a good attitude are what takes work. I am sure Graham probably came into work some days thinking he’d rather have an easy day at home – okay, maybe not that often, but he’s human like everyone and he had good days and bad – but what never fell short was his level of commitment. And that inspired people. It made me work harder. So when I was manager of the reserve side of course I wanted them to do well. I wanted them to do the things in games that Graham wanted all his players to do in games. Attack with pace, get crosses and shots in. I tried to remember that we were all working towards improving the first team. Bertie would sit me down and talk about my coaching and he would remind me that winning reserve matches was all well and good but he put me in my place if I forgot the overall picture. I remember one Saturday afternoon we went to Arsenal reserves and won 1-0. Nigel Gibbs was playing, so it was about 1984 or 85. We were in the top three [of the Football Combination, the reserve league for teams in the south) with Arsenal and Tottenham and I was perhaps getting a bit of an ego about it. I went in on the Monday morning not fully realising what Arsenal still meant to Bertie. That was his club. He was at Watford now but he was Arsenal through and through. He was sat in his big chair in the staff room and I said, ‘Morning Bertie,’ all bright and breezy because of the win at Arsenal. ‘I’m okay thanks,’ I said. I thought, oh he’s grilling me here. Anyway, we went through my team and came up with one ‘maybe’. I’d really been put in my place. The ego I had when I walked in was totally pricked within ten minutes. I wasn’t annoyed by what Bertie said because he was spot on. I had to agree they weren’t quite ready for the first team and he was making sure I wasn’t getting carried away. As a young coach going in to change the world, I learned such a huge amount in a very short space of time. That ethos extended to the players didn’t it? It did. The big players set the tone without the management staff having to get involved and when that happens you know you have a club. They shared the same mindset. Luther, Kenny Jackett, Pat Rice, people like that were fantastic. Pat gave it everything while he was at Watford even though he was nearing the end. Ian Bolton and Steve Sims were different types of people, quieter men, but they were very much in the same groove in their own way. If a younger player stepped out of line, they’d go across to them quietly and bring them into line without having to raise their voice. They had an authority about them. He ran the club, no doubt about it. He respected Elton as the owner and chairman, he respected the directors but he ran the club more or less from top to bottom. He knew what was going on and if he disagreed with something that was being done he’d have his say. How did he find the time? He lived it. He lived the football club, but he was also smart. He did work hard and there were times when he put in very long days but he also made sure he didn’t burn out. And he made sure we didn’t burn out. He knew that if people did too much, or if they got bored, or worn out mentally then the edge would go. I learned a lot from Graham about people management. He was a very clever man. Did it annoy you to see the sort of press coverage Watford got for the style of play? I didn’t really pay any attention to it. And by the way, we got a lot of positive press for becoming the type of club we were – encouraging families and kids, stamping out bad language, or trying. Watford was a friendly place to come and an entertaining place to come. I think the press, even if they did criticise the style, did appreciate what we were doing. Graham stood up for himself but it did get to him that the perception of the football was that all we did was boot it up the pitch. I think some of the criticism became personal for some journalists and they couldn’t see past it. Are you thinking of anyone in particular? I don’t think Jeff Powell [Daily Mail] liked us very much. But they only criticised us when we beat the big clubs. Funny that, isn’t it. We’d beat Liverpool or Manchester United or Arsenal and get criticised. The club had a great youth system, which I guess you were familiar with? Tom and later Steve did so well with that and yes I would never have any qualms about taking their players for the reserves. If Graham wanted 16 to travel with the first team for whatever reason, my best players would go off and I’d go to Tom and take his best players and he’d get the best schoolboys in to fill the gap. That’s how it worked. Everyone moved up. Some youth team coaches wanted to keep the best players so they could get their result but Tom wasn’t like that. He wanted to see his players go on and he saw it as an opportunity to test out some more youngsters while his better players got a taste of senior football with the reserves. If he had an FA Youth Cup game that clashed with a reserve team game then he’d get the best players, of course. I liked working with forwards, because I’d been a forward. I particularly liked Malcolm Allen and Iwan Roberts. Malcolm came out of the Welsh hills and English was his second language. When he first used to come down from Wales to train with us he stayed at my house, as Gary Porter had done when he came down from the north east a few years before. We only had a small house, and we had three kids, so they had to muck in, help with dinner, do the washing up. It was terrific. Working with Malcolm and Iwan was great. They could both speak Welsh and they would in my presence and they’d make jokes at my expense – I know they did, but I couldn’t understand what they were saying. Was Tom as frightening as some people make him sound? He’d say, ‘Come on you, boyo, you can be the best player at this football club.’ The kid would have bright red ears but he’d feel ten feet tall. I think the thing was that Tom wouldn’t bully people. He didn’t pick on individuals and make them his target. He treated everyone the same. If the best player stepped out of line he’d get just as much of a telling off as anyone else. Steve had to be a bit careful with his humour. He was a terrific football coach but sometimes people could see him as a comedian and think that was what he was there for. Steve Harrison was much more than a comedian. He was a great coach, especially a defensive coach. Steve was the joker. I was always the straight man. I have got a sense of humour, but I was the straight man. Steve would dress up as a woman or he’d do a practical joke. Sometimes it was a bit much but he could have the whole club in stitches laughing. I could never see myself doing that. But the thing was the blend of people was terrific. Steve would have everyone falling about and then I’d be the one to step in and say, ‘Okay lads, that’s enough. Time to get back to work.’ Tom liked to bet on the horses. Steve would go along and try to make some money. I didn’t have a clue when it came to betting. Billy Hails was quiet, placid and took things in his stride but cared so much for the players and their physical well-being. When I was injured for 16 weeks with a cartilage injury, I had to carry Billy up and down the terraces to get myself fit. The club had a reputation for developing young players but as you got established in the First Division, Graham signed people who had not grown up with the Watford Way. Did that change things? I think the youngsters who came through all knew what to expect. They were what I call Watford people. People like Kenny Jackett, Steve Terry, Cally [Nigel Callaghan]. Cally would do anything for anyone and I always felt that when he left Watford his career drifted a bit. Bringing players in from other clubs was always interesting because they brought something else with them. To be honest, I was not involved in many transfers. Graham would go off and do the transfers, and he’d call and say, ‘I’m up north, I’m doing a deal with Colin West. I’ll be back tomorrow. Look after this and that.’ And that might be the first I’d heard of it. He would ask our opinion but he was making the signings. He did his homework and knew what he was getting. Graham wouldn’t just meet Colin. He’d meet Mrs West and he’d meet a local coach and he’d meet the family. He was thorough. He was very open to discussion but at the end of it, it was his decision who we signed. I didn’t have any knowledge of Maurice Johnston or John McClelland when they came in. I knew the scouts had been watching these people. The network was excellent. I think Steve [Harrison] would go and watch people occasionally but I had a different role. Well, looking after the reserves, coaching. When we got into Europe I was the European scout. Those European games were wonderful. It was only a few months but it was so exciting. Think about it. I came back to Watford and my first year we were runners-up, second year we played in Europe and reached the FA Cup final. I must have thought to myself, it’s a doddle this job. But the team we played in Europe was a kids team really. Yes, quite a few of them had been my lads in the reserves but Tom claimed it more than I did, because they’d come from Tom’s team and he was a bit stronger than me about claiming the credit. [Laughs] We’d signed one or two players too late for the deadline [notably George Reilly, David Bardsley, Lee Sinnott, Maurice Johnston] so we had to play the kids. So you went to watch the opposition? I went to Kaiserslautern with Eddie Plumley to have a look at them. I’d been a player for 10 years and never been anywhere exciting. My first trip in 1982 was to go to Australia, New Zealand and Malaysia on the summer tour, then I was scouting in Europe. Eddie would go and discuss club things in the afternoon, ticket arrangements, hotel, travel, all the stuff they had to organise. Kaiserslautern played on the Friday night and I watched them and took notes. Just anything that could help Graham and the team. Were they particularly good at anything? Or particularly bad. Could we exploit any weakness? It was a different style of football in West Germany and I felt that with our energy and enthusiasm we could give them a game. What was the trip for the match like? It was incredible because it was brand new ground for the club. Playing in the First Division for the first time in the club’s history had been absolutely fantastic but going abroad in a competition we had qualified for fair and square as the second-best team in the country was wonderful. I know Graham considered us to be representing Watford and England in those games. It could have been all over after the first leg against Kaiserslautern. It could have been but even at 3-1 I don’t think we felt out of it. Perhaps the occasion on the night caught us a bit by surprise. Had any of us been in Europe before? Pat Rice probably had. But it was all new for us and the great thing about the team was that although they lost they never allowed themselves to be put out of the tie. The away goal was so important. You have to remember this was 1983. The War was only 40 years before. Okay, that’s a long time but it was relatively recent. The night before the game we trained on the pitch in the stadium and headed back to the hotel. The directors had been invited out to dinner by the Kaiserslautern directors and I believe they had a very nice meal and a lovely evening. Dear old Mr Harrowell. He was a lovely man. He loved the club and gave so much time to it. He was a supporter in the truest sense of the word. If he’d not been a director he would have been watching the matches home and away anyway. The second leg was amazing. Your reserve team centre forward [Jimmy Gilligan] had scored the only goal in Germany, now his partner [Ian Richardson] got two in the second leg. I remember Kaiserslautern turned up in jeans and T-shirts. I remember thinking ‘they think they’ve got this won, here. They’ve come for a jolly.’ I went into the dressing room and said, ‘They’re disrespecting us here. They haven’t come here looking professional.’ The thing is, we would sometimes travel in a club suit or sometimes in club tracksuits but never in jeans and T-shirts. Maybe that was just their way, maybe they weren’t disrespecting us but it was something we could use to our advantage. We got 3-0 up and then it was a case of not conceding. We had a very young defence and I remember that night being asked to go round the other side of the pitch, next to the Shrodells stand, to keep the lads going and keep them organised on the other side, away from where the bench was. You’re not really supposed to do that, you’re supposed to stay on your bench, so I’m crouching down behind the advertising boards, shouting at Ian Richardsona and Charlie Palmer and Nigel Callaghan. ‘Get yourself tucked in,’ ducking down behind the boards so the linesman couldn’t see me. I thought I was going to get myself banned from Europe. I did that for the last 30 minutes and I got away with it. Sofia was extraordinary. We were training on the pitch the night before the game and they’d let people into the ground and they were hissing and booing and we felt that shouldn’t be allowed but who was there to stop them? I remember we had a corner in extra-time. Callaghan is over the other side taking a corner and he’s getting pelted with stuff. Cally could be temperamental but he was spot on with this one. They were trying to hit him with bottles so he wasn’t taking the corner. There was a delay, then he whipped it in and we scored from the corner. They [the Levski Spartak supporters] were setting fire to things on the terraces. By the time the game was over we just ran off the bench and down the tunnel. It was hostile. In the last game we met our match really. Sparta Prague were a great team, too good for us over two games. We did well to keep it to 2-3 at home. They were good, elegant players. They were better than us. What about the FA Cup run to Wembley in 1984? What do you remember? What I remember is that that season we were all so busy. From the tour to Australia and New Zealand in the summer of 1982 we had a full season in the First Division, then the club had a tour to China, then there were all the European games and we got knocked out of the UEFA Cup in the December and the FA Cup starts in early January. It was all hands to the pump. I remember thinking that we were one of the best teams in the country, but we’ve still got just one club car between us. If we had to go on club business, scouting or whatever, we could take the car. One day Billy Hails had forgotten to put any oil in the engine and we found out the bill was going to be a thousand pounds. This was during the cup run, probably after the fifth round [against Brighton]. Graham announced he wanted a staff meeting on Friday afternoon and we thought it was going to be about the car and that we were going to get slaughtered for it. That was all we could think of. There was Tom, Steve, Billy and myself and we said well, if it’s going to cost £1,000 we’ll all put £250 in because although it was Billy who was driving it when the oil ran out, we’d all used the car and not topped it up. Now we weren’t well paid and we didn’t have £250 to spare but we thought that was the fairest thing to do and we were trying to pre-empt the problem and get it sorted before Graham had a go at us for wrecking the club car. We look in the envelopes, fearing the worst. It turns out Graham had booked a hotel in Portugal for a month and he was sending all four of us for a week at the time, with our wives. I can’t remember who went first but the plan was we’d take turns and have a little break. Graham said, ‘It’s just a thank you from the club for all the work you’ve done.’ This is during the season, during the middle of the cup run. Wow. Fantastic. To be honest, at the time we were more relieved the car didn’t got mentioned. Graham’s wife, Rita, said if any of us had a problem with getting someone to look after the kids, they’d look after them. As it was my in-laws came down to look after our lot. But think about that. We had worked hard and if he had said to me, ‘Go and take a break,’ I would have said, ‘No, you’re alright, I’ll push on.’ But I think he knew we all needed to be told to take a break just to spend a week with our wives, away from the football club. Perhaps he was looking ahead, maybe he was really confident we’d get to Wembley, but either way he was looking after us, making sure we didn’t burn ourselves out. It might have cost the club a few quid to fly us all to Portugal for a week but he was investing in us as people. I tell you, after something like that you want to give everything you’ve got when you are at work. On the day of the Birmingham sixth round game I was flying out to Portgual. If I am honest, I thought ‘I want to be in Birmingham, not Portugal.’ We were going out to Faro as Tom Walley and his wife are coming back. We were flying on the Saturday afternoon, while the game was on, so I asked the pilot if he could let us know the score if they could find it out. But the pilot didn’t say anything so we got of the plane not knowing. And I shrug and mouth back, ‘I don’t know.’ He thought I must know the result because we landed in the early evening. So Tom runs to the phone and makes a call and comes running back to the glass and holds his fingers up. Three one, he holds up his fingers. He’s mouthing ‘We won 3-1’. I can’t hug him, we’re separated by this big glass window. His wife Pauline is smiling, my wife Allie is smiling. We’re absolutely ecstatic because we’re in the cup semi-final. We go and enjoy our week in Faro and Tom goes home. The next day I find the English newspapers and read the report, then we phone home on the Monday and find out we’ve got Plymouth in the semi-final. Graham knew that if he’d asked us we’d have said no and would have said, ‘Don’t tell the wives.’ But he got us that break, because we worked so hard, and it just felt so special. We put the time in, but we didn’t get paid that well really. What do you remember about the semi-final? It was amazing. Little things stick in my mind. I know we got stuck in traffic on the way to the game. We had this tradition. It had started a couple of years before that the staff always had a meal on the Friday night before FA Cup ties. We went to Graham’s house a few times, we went to Geoff Smith’s over in Tring. One or other of us would host and we’d have a great meal and a few drinks and a laugh. We’d never talk football. It was just fun. I think at that meal we had to wear batiks [highly-coloured, tie-died shirts from the Far East] because we’d been to Thailand. Me, Tom, Billy, Pat Rice, Graham, all in those shirts. We didn’t tell the wives we were going to do it. If it wasn’t that time it was another but there was always a theme or something. Another time we had an airline meal – just a meal done in the style of an airline meal and it was hilarious. One night we had fish and chips and we sat eating them out of the paper, laughing and joking. Steve would make us laugh. Billy’s wife Jean would sing. It was fantastic because we knew if we won a cup game, we’d have another one of these nights. I don’t think the players knew. We didn’t exactly keep it a secret but it was something just for the staff and our wives. Before the cup final, Graham had booked a room for the staff in the basement of the hotel. He had made sure all the staff had a Wembley Cup final shirt, embroidered with the lettering and they were in boxes and presented to us on the Friday night. The gesture was fantastic. Graham was so good at doing little things that made you feel special. For him it was always about the football first but if you think about it, in order to be successful, it was really about the people. I remember when I was a player at Lincoln, on FA Cup final day, at about 2pm there was a knock at the door and it was someone delivering a red rose for Allie, my wife. Graham, who was the manager then, had arranged for someone to deliver a red rose to every player’s wife to say thank you for their support for the year, and he got them delivered on cup final afternoon because he knew everyone would be in waiting for the game. At that time, did you think Graham would go on to manage England? I knew he wanted to. That’s what he said he wanted to do. He wanted to be the manager of England. That’s what he always wanted. I think it was always in his mind. He started coaching when he was 19. It’s very rare in life for someone to set such a huge goal for themselves and then achieve it. Becoming England manager didn’t change Graham, nor did he change when he got so badly criticised. I know that hurt him but I like to think he always knew he could pick up a phone and call me and have a chat. Not so long ago, our physio at Lincoln, Bert Loxley, died. Graham always remembered Bert and stayed friendly with him. I’ve been to Graham’s daughters’ weddings, he’s been to my daughters’ weddings. We built friendships that went so far beyond football. Just going back to the FA Cup final, what did you think about Wilf Rostron being suspended for the game? I felt it was wrong for Wilf that you could get sent off in one competition [the league] and miss the biggest game of your career. What do you know about the selection dilemma before the match? There wasn’t much issue, as far as I know. You may tell me differently but as far as I was concerned Neil Price was the reserve team left back so he was going to come in. He’s the left back, he’s going to play, that’s how it was. You didn’t think there were other options? Maybe Kenny Jackett could have gone to left back but then you lose his industry in the midfield. Do you change one player or do you change two areas in the team? That’s the question and I think Graham wanted to keep the best things about the team as constant as he could. Put in the reserve left-back and hope he can cope with the day. He was up against a very, very good right-winger though [Trevor Steven] so it was never going to be easy. What else do you remember about the week leading up to the game? Graham took us to the hospital in Stanmore where there were young people who’d been in motor accidents and were paralysed. We went to see them and say hello and try to give them something to brighten their day but it also kept the players’ feet on the floor. It was the sort of thing Watford Football Club always did, but it had a benefit for all of us because it put the cup final into perspective. Everyone said ‘enjoy the day’ but I can’t say I did enjoy the day. We would have enjoyed it if we’d won. I remember we [the staff] walked round the pitch before the kick-off and went to sit on the bench. My mouth was dry and I wasn’t playing. Bertie had stepped aside, moved upstairs and was a director by then I think, so I was assistant manager. It was a special day, a great memory to be involved in a cup final. I know it’s a cliché but if you don’t win it’s not a lot of consolation to say, ‘well, at least you got there.’ It doesn’t feel like that at all. As the years went on and Watford established themselves as a mid-table side do you feel the club changed much? There was the odd brush with relegation early on in a couple of seasons but mostly you were totally comfortable. How did Graham achieve that? Was it down to his recruitment? We couldn’t compete with the big clubs. We had Elton’s money but as we stayed in the First Division there was an expectation that the club could support itself without having to go to Elton. I know Elton did support the club financially to a great degree and there were times he must have put money but I don’t know the specifics of that. I do know that Graham knew he couldn’t afford to buy many bad ones. Graham was very frugal with the money. He treated it with respect, as if it was his own money and he wouldn’t take a punt on people. He spent a hundred grand on Colin West, or 200 on Maurice Johnston. Good money but not the sort of money that would come back to haunt him if it didn’t work out. We weren’t looking above our station. We couldn’t go and buy top players from Liverpool. We were still Watford. Do you feel that by 1986, 1987, Graham’s style had evolved a bit? I remember signing Kevin Richardson from Everton and he was a typical cultured midfielder. I watched Kevin. I remember going to Southampton and watching him play for Everton. I remember saying to Graham and saying, ‘I’m not sure we can get him because I think he can go somewhere bigger than this.’ But Graham got him and he was a great signing. I remember seeing him at The Dell and thinking, if we get him that would be fantastic because he created things, he found time on the ball and he kept the ball so well but he wasn’t afraid to work hard. Perhaps you could say he was an upgrade on Les Taylor, and I don’t mean any disrespect to Les there at all, but Kevin had those fighting qualities too. How did you find out players who might be available? We had a network of people who we knew and we could trust. They were giving us information or gossip about players. Football is like a school playground really – rumours and gossip go round like wildfire. You just have to work out what’s true and what isn’t. Is a player happy at his club? Would he like a move? Graham was always, always looking for something extra. Even in the years when it might not look like the squad changed that much he was scouting. He wanted to keep changing things around, change your players or your staff to keep things fresh. How did Watford keep John Barnes for so long? Football was different then. I remember there was interest in John right from the start. When he scored that goal in Brazil [in 1984] I thought we might lose him. Then he genuinely was one of the best players in the country and when you look back now it’s a miracle he stayed six years. Could a player as good as that stay with a mid-table side in the Premier League for six years now? Half a season is all it takes to get a move now. I think it was a number of things. John’s dad trusted Watford. He was still a young man so he wasn’t in a rush to go to a bigger club. I think Graham told John that he would let him go when the time was right but that it would be good for him to go as far as he could with Watford so that when he made the move he would be ready for it. Could John have gone to Liverpool at 20, 21 and been the instant success? Possibly you could say yes because he was that talented. But by the time he went  he was mature, fit, strong and in that Liverpool side he was surrounded by such good players that he could really step up a level. We saw in his first season there he absolutely destroyed teams. But I genuinely think John enjoyed it at Watford. I remember him going off to play for England, and he’d come back to us on a Thursday and he’d be pleased to be back. The players were very comfortable, they were relaxed in the environment. Watford was a small town club, so did you always feel like the underdogs? It was but it was a club that became so important in the town. When I was a player I lived in Abbots Langley in a club house next to Keith Pritchett [Watford defender]. When I came back I bought a house in Croxley Green. Steve Harrison would pick us up in the club van and we’d go into work. Our kids went to the same school. On your point about being underdogs, we had no right to go into London and win, according to the press. We were the provincial boys, and we were beating the big boys. But to win the big games was fantastic and we managed to get results every season against the really top clubs. Bringing [Ian] Rush and [Kenny] Dalglish into Vicarage Road was amazing and giving them a game was fantastic, On our day we could beat them. So when we did beat these people it made it even more special. Did Watford and Graham earn the respect of these people? The football people at many of the top clubs were magnificent with us. Sometimes the managers would say something about long ball but generally that was when we beat them so it was an easy excuse for them to blame our style. But one-to-one they recognised what the club had done. The likes of [Bob] Paisley and [Joe] Fagan [Liverpool managers] had a lot of respect for us but that was because they were such professional and respectful people. They got to work with the best players in the country. They knew we had some good players but we weren’t working with the very, very best, so I think there was some admiration and respect for what we were doing. Some people would see us as upstarts but that’s fine, we could look after ourselves. Graham had opinions and gave them when he was asked. He wouldn’t keep things to himself if he wanted to say something in the press and he was strong enough to stand by what he believed. Some people didn’t like that. Some did have a grudging respect. But the really top guys were so classy. At Liverpool they invited us into the Boot Room and it was absolutely fantastic. Just to say you’ve been in there, in that legendary room where all their coaches and managers had sat and drank cups of tea and talked about football. What a privilege. I asked about John Barnes staying, but were you surprised Graham stayed as long as he did? Did you feel he thought that to get to the very top he’d have to go? Maybe some people thought Graham would burn out, but he kept the success going, and it was not going to fizzle out but I think he knew that it was going to be very difficult to finish second in the league again. He knew he was working with very good players, honest players, but that sometimes that’s not enough. We got in the dressing room. The lads were in there, deadly quiet, looking at the floor, wondering what the gaffer’s going to say. Graham wasn’t unpredictable – if they’d had a bad game he’d tell them. The thing about that game was that they hadn’t been bad, they’d just been well beaten by a very good Forest side. Some people will hear how you’re saying something, others will hear what you’re saying. One player will say, ‘We got a bollocking today,’ but won’t have heard what was said, just the manner it was delivered. So you need to be careful about how you tell people something, not just what you say to them. Graham was passionate and he could get angry. I’ve seen him leap across the table at Wilf for giving away a free-kick in the last minute when we drew one each at Cardiff when we should have won 1-0. One or two of us were about to stop him, but Graham’s not daft. He knew the table was there, he wasn’t really going to get Wilf by the neck, it was just a bit for show. But Graham was smart. He knew that just telling people off has no effect. Leaping across the table at a defender who’s made an honest mistake might sound like an over-reaction but maybe we had worked on not giving away silly free-kicks in dangerous areas, especially not late in the game. Sometimes you have to think, might it be best to let the cross go in and see what happens rather than give away this free-kick now? We were biting our bottom lips trying not to laugh. We’ve lost 2-0 and you can’t be laughing when he’s giving you a rollocking because it’ll be ten times worse. One of the times when it wasn’t best to be sat next to the club comedian? Harry was good as gold really. He didn’t judge it wrongly too often. When we had those nights at Baileys [the nightclub] and we’d put on a bit of a cabaret show and invite the supporters, Harry was in his element. It seems crazy now doesn’t it but that’s what we did. We’d rehearse it and everything. Graham could sit in the audience having the mickey taken out of him in front of 2,500 Watford supporters. It was done affectionately and it was funny but Graham never got annoyed. He took his job very, very seriously but he never took himself too seriously. Graham maybe came across as serious but I know him as a very funny, sociable guy with a really good sense of humour. As coaches, did you and Steve have a different relationship with the players than Graham did? Myself and Harry were a buffer if you like between the players and the manager. Sometimes things would happen, trivial, mundane things, and we would deal with them and not bother the manager with them. Sometimes we were there just to add that bit of distance. The players could moan to us and we wouldn’t go running to Graham to tell him what they’d said. So the players could trust us. Our advice was always the same. Knuckle down, do your best in training. When Brian Talbot came as a player from Arsenal I think he found it hard. He was a senior player and he was always wanting to know what was going on, what was happening. We’d say, ‘Oh just get on with it, Brian.’ But he couldn’t, he needed to know what was going on. Graham had finished and changed and was pulling out of the car park. Most of the time the players were fantastic but we’re talking about a group of 20 men in their twenties. There’d be the phone calls from people saying they’d seen George [Reilly] and Maurice [Johnston] out. George tried to keep up with Maurice’s drinking but he couldn’t handle it like Maurice. Maurice could be out till 5am in the morning and he’d be in training on time. For all Maurice’s love of a drink and the ladies, it never compromised his football. Barnesy and Cally liked a McDonald’s and that was fine in moderation. You’re working with young people and when you are working with young people you know they are going to push the boundaries. We’ve seen everything – they had to be special to come up with something new. Maurice was good at coming up with something new. He did things I’d not seen before. Staying out all night was a new one for me. On the odd occasion, Graham would turn a blind eye to something Maurice was doing because he knew he could keep it together. He was like Dennis the Menace, always in bother. 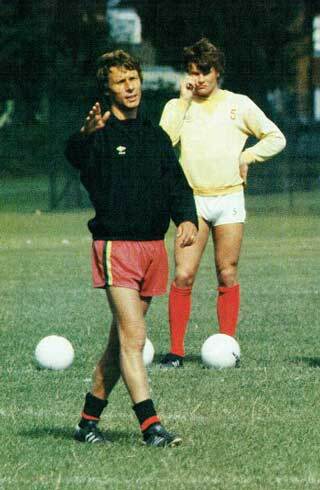 Come next day he could do it in training so there was a limit to what Graham could say to him. What do you remember about the 1987 FA Cup semi-final and the goalkeeping situation? We discussed it, of course. We talked about all the options as a group but the bottom line was that Graham had to make that decision. Spurs had some great players. Hoddle, Waddle, Clive Allen was scoring goals. We were in turmoil with two goalkeepers injured. The transfer deadline had gone past, just about every goalkeeper in the country was cup tied. I can’t remember what the rules were but could we loan someone from another club? I think we had to find someone who was not registered with an English league club and who had not played in the FA Cup that season. Have you spoken to Graham about it since? I have never really discussed it with Graham. I’ve never asked him what really did happen. We lost the game 4-1 and so it’s easy to say it was the wrong decision. So what do you remember of what happened? We went up to Lilleshall to train before the game without Tony. He was definitely out. Then Steve was injured. We were going through the options and we were at a loss as to what we were going to do. I think we were all surprised that Gary’s name [Gary Plumley] had come up. Did you talk to Steve Sherwood? As the coach you work between players and managers. You’re the buffer. Steve said he would be alright. I think I was confident that if Steve said he’d be okay he’d be okay. Then he didn’t play. I was involved in the conversation and I don’t think the manager thought Steve was going to be fit. There’s some incredible conspiracy theories about – such as that Graham knew he was leaving and so didn’t want to reach the FA Cup final. No way. I can see where that theory could have come from because it was such an unusual decision to go with him [Plumley] but I absolutely don’t buy that at all. I don’t think Graham knew he was going at that point [April 1987] and even if he did, and knowing Graham, he would have wanted to leave having won the FA Cup at Wembley. So no, not for me that one. Everything I know about Graham tells me that that was just never the case. I think he genuinely thought Steve was not fit. We didn’t have any real options. I think the thing was that Eddie [Plumley, Gary’s dad] had suggested Gary could sit on the bench just in case. You could have two subs then and perhaps it might have been sensible to have a goalkeeper on the bench if there was a doubt about Steve’s hand. But when he [Plumley] joined us for training I still didn’t think he was going to play. Perhaps Graham thought the team could get away with it? I don’t even think it was that. Graham could do something from so far out of left field every now and then but I don’t think he was trying to be clever. I think he thought there was no choice. What about selecting David James? He went on to be a top goalkeeper and was the junior keeper at the time. He was. And he did go on to be a top keeper but I don’t think we’d have done that to him. How old was he at the time? Can you play a 16-year-old in a cup semi-final? I’m not sure that’s fair. I see what you’re saying and we might have got away with it with a 16-year-old centre forward or a right winger for the day, but goalkeepers and centre halves are the most pressured positions for young players to come in. David has had a top career but he was 16 and I think he’d only just started playing for the reserves, simply because Tony was injured and Steve moved into the first-team. But to throw him into the semi-final for his debut I don’t think we could have done that to a young player. We had a duty of care for his career and you just don’t know what an experience like that will do. I suppose it was a strange day? I think it affected the confidence of people. We didn’t know the goalkeeper. Would he stand up to it? It was a very surreal day. I think we felt our chances were diminished because we were up against Hoddle and Waddle and they were good enough to really take advantage. We hadn’t even got a goalkeeper that we knew so we were up against it. It was a real shame because the timing of it was awful. I was at Steve’s fitness test and I was of the opinion that he had come through it okay but we went with Gary and it was very difficult. We didn’t get the lift of scoring first. Perhaps if the outfield players had been given a bit of encouragement by a good start we might have been okay but we went behind early and then it sort of all caved in. I would never have a go at the players but there was a ready-made reason for not winning. Sometimes you have that feeling. I don’t mean intentionally but confidence and belief is so important in football. I think if you don’t have confidence in the man between the posts it is very hard to perform. It was very difficult on the bench. It was Graham’s responsibility because people will question the manager. They don’t really question the players. I can imagine Graham going through everything and trying to think of whether he made the right decision. No matter how many friends you have, you feel very lonely at times like that. What could I say? Bad luck, Graham, it didn’t work out. He picked the team he thought was best and we lost heavily. I think we were all there on the bench not wanting to say anything about the goalkeeper because it was obvious he wasn’t up to it on the day. Not his fault either, by the way, but it was a strange day and a very strange atmosphere afterwards. It was quiet. Ossie Ardiles came in and said ‘bad luck’ which didn’t go down too well. I think it wasn’t even a feeling of disappointment it was a sense that really we hadn’t had a chance. And within weeks the Graham Taylor era is over. He goes to Aston Villa and a lot of Watford supporters thought you might be the obvious man to replace him? It was so strange the way it all happened. I had been struggling with my breathing. I had a problem with my nose that stemmed from my playing days. I’d had a few cracks on the nose and was having trouble breathing properly so the septum needed re-setting. The club were going to China and I pulled out of the trip because I needed to have my nose done. I went into hospital and the op went wrong. A few days later I haemorrhaged. A blood vessel in my nose burst. I had to go back to hospital, I lost a lot of blood. I had to have a blood transfusion and I really wasn’t too well. He tells me Billy Hails is taking them. ‘Right, well, flippin’ heck,’ I think. I’d been out of the loop and I had not picked up on the vibes at all. I said, ‘Who’s coming in?’ He said, ‘I don’t know, but I’ve come down here to tell you I’m going and I think you should go for it,’ meaning the Watford job. I go into the ground and say, ‘What do you want me to do to help?’ I was called in to a meeting with Bertie Mee, the board and the chairman. They tell me that Dave Bassett is coming in, and he doesn’t want me. So, I had gone in, asking if there was anything to do to help and I’ve basically got the sack. Then I am going home at 10.30 saying I haven’t got a job anymore. I was unwell, my two pals are going to Aston Villa and I’ve lost my job. To be fair to Dave, he spoke to me. He had the courtesy to call me. It wasn’t just a case of him wanting John Ward off the premises before he came in. He was good about it and I understand that managers want their own people and that he wanted to bring in the people he knew. I could see it, he needed to break with the past. You ended up going to Aston Villa eventually? Steve came back to replace Bassett when Watford sacked him and I went up to Aston Villa to work with Graham. That was after about six months. We had a fantastic couple of years, won promotion, finished second in the league and then he buggered off again to England and left me with Josef Venglos, speaking his English for him. [Laughs]. Venglos was Hungarian, wasn’t he? That’s right. He could speak English, but he only did when it suited him. Quite different to working with Graham then? Yes, with Graham I like to think he trusted me to be his number two in every sense. At Villa the fans might read in the paper, ‘says Graham Taylor,’ but the reporter would have been speaking to me. The paper wants its quotes from the manager, Graham Taylor, not the assistant, and they wanted stories every day but Graham didn’t have time to speak to the press every day so he trusted me to do his talking for him. The press were happy. The fans didn’t know it wasn’t Graham saying it but I was talking on Graham’s behalf. To work with someone like Graham and be trusted like that is a really tremendous thing.